Meanwhile, I found out about a Twitter event called #PitMad. #PitMad stands for Pitch Madness, and it happens every quarter (there is a thorough and awesome summary here). Agents and writers participate online; agents share that they are participating using the hashtag, and they also share their guidelines and what, specifically, they would love to see. Then, authors pitch their books using both #PitMad and their genre — in my case, #nf, nonfiction. If an agent likes your pitch, she favorites it, and you are welcome to query her. You have a massive leg up by sharing that she found you through #PitMad — the agent has already told you that she likes your basic idea, so chances are good that she will 1. Read your proposal and 2. Ask to read the manuscript. Short story: I used Twitter and finally had to stop whining about social media. Read the rest of the long, sordid tale on We Heart Writing. Shameless plug! DIY Chick Lit is free this weekend on Amazon—get yours now (and tell all your wannabe-chick-lit-writer friends). Everyone loves to get away, and it’s something writers dream of. But like I wrote in DIY Writing Retreat, you don’t need a bunch of money or time to get away. “Getting away” just means changing your scenery, and there are ways to do that every day, if you want to. I have to write a brand-new pitch letter and I really don’t want to. I have to revise something, and I really, really don’t want to. I want to research something. I want to get some new ideas—I’m feeling bored with what I’m working on, and it needs some facts/background/new ideas to make it more interesting. I haven’t left my house in a few days and I’m starting to feel like a hermit. When I don’t want to do something, I go somewhere totally new and random. My personal favorite is a library in a different town. Thanks to the Rollinsford Library, I revised my thesis. In a new town, there’s very little chance you’ll run into anyone you know, so you don’t have to explain yourself or worry about distraction. It’s fun to be in a new place, and a library doesn’t require you to interact with anyone. You can put on your headphones, open up your laptop, and be “that” guy/gal. Going somewhere different somehow makes it clear that this task is a departure and not what I have to do every single day for the rest of my life. When I’m done, I can go home. So that means that I will, at some point, be done. When I need to research something, I try to go to an actual physical place related to what I’m doing. Maybe that’s a library (I’m lucky to be able to go to the gorgeous downtown Seattle library, which has almost every book anyone could ever want). Maybe it’s a setting related to a story I’m writing: a dock, a baseball field. Maybe it’s a place where people who I’m writing about hang out, and I try to interview them (for me, that’s usually a church). The Internet is vast, but people are deep. They will give you much more information than you can get from the most well-researched article; they can point you to other people, give you the real story, make you consider your story from a viewpoint you hadn’t thought of. Getting out and talking to people is scary, but people love talking about their experiences. So don’t be a hermit. Sometimes I give myself a reward for being brave and asking a stranger questions (a latte with a crazy amount of sugar in it). When I want to get new ideas, or I’m just feeling kind of bored with whatever I’m working on, I go to a museum or a new place. I go with Andrew on a day trip to a new town and we explore all the local stuff there is to see there: cafes, shops, local history museums. Travel, even to someplace an hour away, wakes up my brain and makes me feel like the world is a big, interesting place. Because it is. When I can’t make myself write anymore but I really want to feel like I finished something, I go to a coffee shop, even just for 45 minutes, and bang out a draft of something. I either set myself a bite-size task (“just write one blog post”) or I free write for a while. Sometimes I get ideas, sometimes not, but it’s all practice. Not every day is going to be a stellar writing experience. I have the luxury of having mornings and early afternoons to myself, the trade-off of working in the evenings. If you work a regular job, you might try going somewhere new after work: a new bar or coffee shop where you can sit and write for a bit before you go home, or the library in a different town. If you have kids or home duties, try thinking of it as taking a class or joining a book group, and trade your buddy for another free night. If that’s not possible, you might try joining a writing group; then, at least occasionally, you can host it at your house. It’s not a new setting, per se, but it will shake up how you think of your house (I certainly like my living room a lot more when it’s clean and filled with snacks and friends). Getting away can be tricky, but it’s worth it. If you’d like some more motivation and ways to get away for a retreat, check out DIY Writing Retreat. It includes a schedule for what to do every hour of a day- or weekend-long getaway, and even includes a shopping list and recipes, so you can focus on just writing. I’m also creating an e-course based on this retreat that includes worksheets and email-lessons tohelp you actually take a retreat. If you’re interested in test-driving it, you can sign up here. I love reading about how other writers write, but mostly because I like reading about other people’s lives. I like all the idiosyncratic details: a writer eats Oreos for breakfast, a writer can’t write until her daughter is asleep and it’s 1 am. But whenever I read how a writer writes, I’m really looking for something more: a clue about how I should write. And of course, I never find it. When I set out to write this post, I wanted it to be something different. Because although it might be interesting to you that I write at a fold-down table from Ikea that also holds a sewing machine, I’m guessing that what you’re really looking for is the secret, perhaps housed in that incredibly inexpensive and versatile table, to being a successful writer. Because that’s what I’m always looking for. Though I’m far from a successful writer (I pay the bills by doing other jobs), I have gotten a lot of things done. I’ve published two ebooks, completed a nonfiction manuscript, and found an agent. I’ve written a draft of a novel and half revised it. I’ve had essays and articles published online and in print, and I’m a(bout to be) columnist at Alt Magazine. I’m striving toward my own personal Holy Grail: a traditional book deal. I’m making money writing, and I’m working towards making it my full-time job. So, here’s how I do it, plus insights for how you can do it. It’s not rocket science, but I have two secrets: consistency and getting away. This week, I’m writing about consistency. Next, I’ll tell you about getting away. Consistency means that when I wake up each day, I come downstairs, make a cup of coffee, and check my email. After half an hour of doing basically nothing and playing with the cat, I open my laptop and look at my to-do list. The list includes pressing writing tasks (an essay I need to pitch, a draft I need to revise) and marketing tasks (a guest post I need to write, a blog post I need to do). Though I wish I could start every day with my “important” “serious” “artistic” writing, I usually don’t–unless I have a deadline. Sometimes consistency is kind of like a boring black square. But once I have a deadline, internal or (hopefully) external, consistency is what gets everything done. I don’t mean just in writing habits, which everyone has told you a million times (“Wake up and write first.” “Don’t stop until you reach 1000 words.” “Schedule your writing time in every week.”). I mean consistency in your writing tasks. These aren’t limited drafting, revising, and editing, but also pitching and submitting. I try to pitch two to three essays a month. I try to resubmit my stories to five new places every time they get rejected. I try to write one “real” thing each week, something that doesn’t feel unimportant. There has to be a balance between writing and submitting. The balance will look different for everyone: last year, I submitted a few stories and queries, but mostly, I wrote: a novel, a book proposal, a revision of another book proposal. And my writing improved. This year, I’m pitching magazines and posting on my blog much more. And my writing credibility is undoubtedly higher: I’m getting things published, and editors are actually responding to me. But I want to be careful not to get stuck in the trap of churning out bite-size pieces of work when what I really need to do is buckle down and complete some big projects—last year’s novel draft has been sitting in storage for months. Still, there is a balance. It might be from week to week, month to month, or year to year, but writing takes both the actual writing and the sending your work out into the world. If you don’t have consistency in doing both, your work won’t get published and you won’t ever get down that brilliant idea for a novel you’ve had for years. Make a spreadsheet of submissions/pitches, the date you sent it, and the response (more on this coming to The Write Life). Highlight the ones that haven’t come back yet. Set yourself weekly or monthly numbers to hit: X pages, X pitches. It almost doesn’t matter what you pick at first, because you can change the number the next week/month if the ones you pick aren’t doable (or get done too fast). Email a friend who really, really likes you and tell them you want to send them your manuscript/story/essay/article when you are done on X date. As soon as you finish a short story/essay, send it out to a friend and ask them for feedback. You don’t have to revise it right away, but when it comes back, you do. Email a group of writing friends (or better yet, meet them for coffee) each month about what you’re working on, what you need to work on next month, places you’ve submitted work or pitched and editor, and rejections and acceptances. It sure feels nice to yell about uncaring editors to someone else. I’ve done each of these things, and they have dramatically changed how I write and what gets done. Perhaps, most importantly, they let me see the progress that I’m making. Because if an essay is pitched in the Internet and no one sees it, was it really pitched at all? Here’s a sneak peek of the next post: one way I’ve gotten away. Everyone has writers who they love. As a writer, you have to start paying attention to why you love some writers more than others. Is it their style? What they write about? Who their characters are? How do they make those characters? How do they take you to that place? What, exactly, keeps you reading—a constant cliffhanger, a secret the character has, an unreliable narrator? A Tree Grows in Brooklyn (Betty Smith): I read this several times when I was younger, and I just reread it again last year. I was amazed at how I couldn’t stop reading it. It was the details: the caul of a newborn sold to a sailor, the paper collars Francie buys for her father. For a week, I lived in Williamsburg (yes, the now-hip neighborhood in Brooklyn) with a poor Irish-American girl growing up in 1918. The dialog is also amazing—Smith was also a playwright. This book is perfect: the family history, the tension between autonomy and circumstance, the inner life of a teenager becoming a woman. The People of the Book (Geraldine Brooks): Brooks started out a nonfiction writer (her first book was Nine Parts of Desire, a journalistic account about women living in in different parts of the world that practice extreme Islam. Also amazing.) and her fiction is as well-researched as her nonfiction. The People of the Book follows the fictionalized history of a real illuminated Hebrew text. Each person who owns the book has a past, a conflict, and a future. We get only a glimpse. I read this book, loved it, and read it again to figure out why. I realized that, once again, it’s the immense amount of detail that is woven in without our noticing it. Sarajevo is illuminated through dinner at a restaurant and a walk to a bakery; medieval European Jewish life is drawn through a family’s hustle to find a suitable gift for a family friend. This makes it sound like a history book, but it’s not—every historic episode is a massive cliffhanger, just resolved enough to allow us to move on to the next. 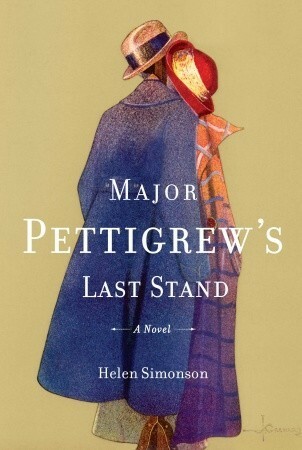 Major Pettigrew’s Last Stand (Helen Simonson): I just read this, and I’m still conflicted about how to feel about the (slightly racist?) people in the story—but they are so well-developed and true to life that their sentiments can’t really be attributed to the author at all. Major Pettigrew is a curmudgeonly, inspiringly sarcastic old man, and his sensibilities about what is right and wrong are shared by a strange cast of characters: a Pakistani shop owner, her bitter nephew, and a strong-willed dancer who is a single mother. The things that Major Pettigrew notices on the morning after his brother dies are heartbreaking: he is sitting in the red lumpy chair that he hates to sit in, drinking from a cup he uses to hold his toothbrush. As soon as I finished this book, I started reading it again because it was so damn entertaining. Reading shows you how to do things as a writer. If you read carefully—and by carefully, I mean occasionally asking yourself “Wait, why do I like this? Why do I hate this?”—you will discover not only what you love about these authors but what you love about your own. It’s amazing, and it’s true. Details are what I try to bring out in my own essays and stories, and details are what get things done in my work. What’s the special stuff that gets things done in yours? *If you liked this post, you might like my monthly e-zine, Greetings from Bookland! I’ll send you a mini writing lesson + prompt each month–plus you’ll get my guide on How to Be a Writer! Sign up here.